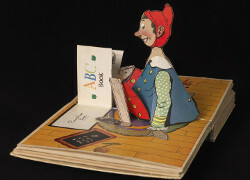 Pop-up books have been engaging readers and non-readers alike for over 800 years. The fact that this form of book art has thrived speaks to the fascination we have with the art of transforming two dimensional paper forms into a continuing chain of three-dimensional possibilities. Making Paper Dance: The Art of Pop-Up Books is both a nostalgic homage to early movable books and a view into the dynamic and ever-evolving world of pop-ups created in the 21st century. This exhibition is curated by Linda Ross of Linda Ross Contemporary: Art + Projects.